Essentially this award is like a Meme. There are rules for paying it forward after your blog gets recognized. 1) Select 5 blogs that you consider deserving of this award, based on creativity, design, interesting material, and contribution to the blogger community. The blogs can be in any language. 2) Post a link to each blog so that others can visit. 3) Each award-winner has to show the award and link to the blogger that awarded it. 1) A Year of Reading. My mentor blog. Mary Lee and Franki have been going all out this summer. I see them post once and sometimes twice a day. I have learned SO much from them both. Everyone needs a mentor like these two ladies! 2) Help Readers Love Reading. A new blog I started reading this summer. I really like that the author is a male who teaches the same age as me. It gives me an entirely different perspective on books for my students. Here's to you, Brian! 3) A Teacher's Life. Jen is great! We have never met in person, but I know if did, we would be best of friends. She always has such kind words and thoughtful posts. 4) Jen Robinson's Book Page. Besides having THE BEST posts in the universe, Jen always keeps up with other's blogs. She regularly comments on my rambling boring blogs and has something nice to say. And she does my Memes even though she hates them. 5) Greetings From Nowhere. Barbara O'Connor is my best author friend. No matter that she is my ONLY author friend. But seriously... her posts are funny and informational. She has tons of great posts about writing like her Writing Tips Tuesday. She also has great information for author visits that I also enjoy hearing about. Want something to do today? The July Carnival of Children's Literature is up at Read. Imagine. Talk. I have been very busy becoming an aunt today! I saw two videos I liked today. I will share them with you. Waiting For Normal by Leslie Connor is just one of those books that makes me say "Whoa!" As soon as I finished reading it, which by the way was very quickly, I thought to myself, "She GETS IT." The "she" being Leslie Connor. The "it" being the lives of so many children in the world. But Connor also must have done so much research, either that or I have lost the fact that she was once an elementary school teacher. She had so many of the little nuances of school life correct. As a teacher, you just know when someone has done good research on school because they get things right down to the little details. The story is of Addie and her dysfunctional life living in Schenectady. And when I say dysfunctional, I mean it. There is a little bit of everything in Addie's life. Some of the most stable parts of Addie's life are slipping further and further away. The story shows how Addie attempts in her own childish way to hold it all together. Some people may think this character is trying to overcome way too much for one book. It may seem like Addie's battle is too complicated for one person. I might think that too, had I not seen it for my own self in the lives of students in my classroom each year. I am always surprised how resilient children can be. I have seen this EXACT student in my classroom. Boy does it tear your heart out! What I like about the story is that Connor doesn't go the convenient way and have a teacher try to save Addie's life. Although I would have enjoyed this, I think it may be too cliche. Being honest, sometimes situations like Addie's can fly under the radar. Especially when the student is moving from school to school. I would recommend this book to GIRLS in my class. I would love to say I would read it aloud or recommend it to everyone, but that is not possible in this case. Although it is one of the best books I have read this year for my age group students, it has far too much girlie talk to recommend to a boy. (Sorry, but I am NOT talking about "Periods" in the classroom in front of fifth grade boys) One other point I was not fond of was the way Addie called her mom "Mommers." Yuck! Don't love that. I am not a fan of weird names in books. I would love to hear other Teachers opinions of this book. Read it! I promise you'll love it. 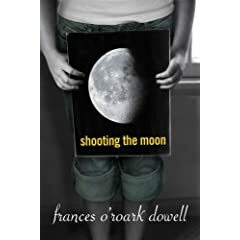 When I was on vacation I devoured Shooting the Moon by Frances O'Roark Dowell. At first I felt like I wasn't sure it was the book for me, but as I read on, I really Loved It! The story is short at 150 some pages. It is historical in nature, the setting being during the Vietnam War. (And of course you know I love that) But what is HUGE about the book is the message about changing perspectives. Jamie, the main character is an "Army Brat" whose brother has recently joined the army and will soon be sent to Vietnam. Jamie lived her whole young life believing there was no better place to be than fighting for your country in war. That is until she actually comes face to face with the realities of war. Her brother's first letter home to Jamie is less of letter than she would like to receive. Instead it was a roll of film he would like developed. Not just developed by a store, but actually developed by Jamie herself. As the story goes on the pictures become more and more truthful with the realities of war. This isn't the only plot line going on in the story either. Jamie has a summer job working in the rec hall where she becomes friends with some men in the army. And there is also the story of how Jamie's Colonel father deals with her brother's deployment. I think students in my class could really get behind this book. Not only is our town situated very near to an Air Force Base, placing many military children in our district, but there is a war currently happening. This book would really be a great starting board for talking about some of the harsh realities behind war. Frances O'Roark Dowell is very careful not to be too preachy about war or even too supportive of war. The novel had the perfect balance for me. Take a small portion out of a day and sit down with this special novel. You won't be disappointed. I guess I missed my Blogoversary... or however you want to say that! It has been one year since I started this blog. This post will make 156 posts. There have been ups... meeting authors (here and there), making friends, having fun. And there have been downs. But I would not trade this experience for anything. I have learned so much, and continue to make many new friends!